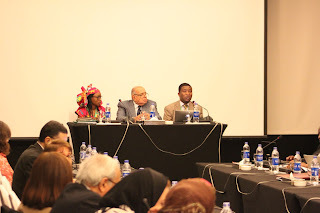 CAIRO, Egypt (PAMACC News) - Ahead of the sixth special session of the African Ministerial Conference on the Environment (AMCEN) scheduled for the 16th-19th April 2016, civil society consultations on the Paris agreement and the 2030 Agenda began this morning in Cairo, the Egyptian capital. Organised by the United Nations Environment Programme (UNEP) and the Pan African Climate Justice Alliance (PACJA) in collaboration with Major Groups and Stakeholders Forums, the Post-Paris workshop aspires to interrogate the overall African performance in COP21, the Paris Agreement, and its implications for Africa in the short and long-term development agenda. The consultative workshop also seeks to internalize the new set of Sustainable development goals and their implication for Africa with a view to identifying and defining the action agenda for different stakeholders towards COP22 in Morocco. The Pre-African Ministerial Conference on Environment (Pre-AMCEN) will serve as a platform for African Civil Society Organisations as well as other stakeholders to effectively contribute to the process. The Major Groups and Stakeholder Forum held in Nairobi from 15th – 19th February, 2016 will inform the AMCEN discussions. PACJA in collaboration with UNEP/ROA has organized the Pre-AMCEN Civil Society Consultative Workshop as a distinct activity aimed at contributing to the achievement of the continent’s environment and sustainable development agenda. This year’s Pre-AMCEN Consultative workshop runs alongside the UNEP Major Groups and Stakeholders Forum and as usual, ahead of the main AMCEN sessions on 16 -18 April 2016. The workshop is organized by PACJA in partnership from UNEP- Regional Office for Africa- ROA and other Institutions with a shared vision. In attendance are representatives of civil society, parliamentarians, and Governments, international development agencies, regional integration bodies and UN Agencies. The consultative workshop broadly reflects on COP21 outcomes, the Sustainable Development goals and plan for the second United Nations Environmental Assembly scheduled 23 -27 May 2016 in Nairobi-Kenya. The African Ministerial Conference on Environment (AMCEN) which consists of African Ministers of Environment from across Africa will from 16th – 19th April, 2016, in Cairo, reflect on the Paris Climate Change Agreement and the New set of Sustainable Development Goals. The Conference, coming just before the ceremonial signing of the Paris Agreement in New York on 22nd April 2016, is an opportunity to prepare African Governments for the implementation of the Agreement. The meeting comes at a time when the preparatory process for the COP22 this December, in Marrakech, Morocco is gaining momentum.